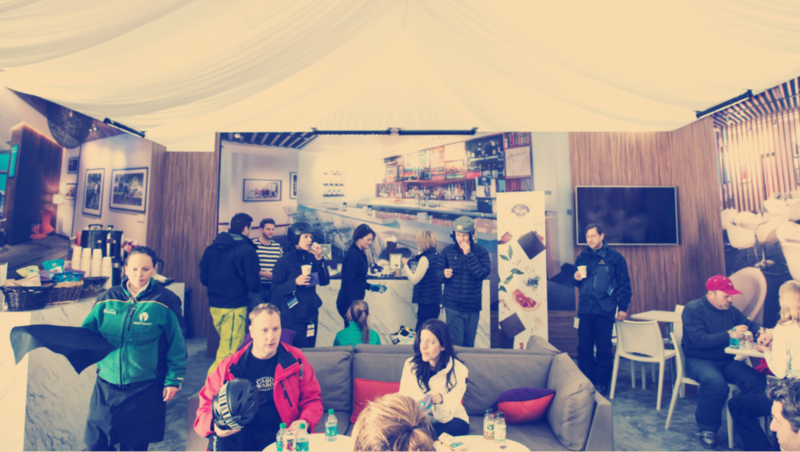 American Express is growing its network of Centurion airport lounges, and to get the word out to its ski-loving cardmembers, the company in March opened a Centurion Lounge pop-up in Deer Valley. The idea behind the installation, which was open from March 6 to 22, was to familiarize card members with the lounges, which are located in four U.S. airports—Las Vegas, Dallas/Fort Worth, New York’s LaGuardia and San Francisco. A fifth Centurion Lounge is slated to open at Miami International Airport in the coming months. Just like the airport lounges, the Centurion Lounge at Deer Valley was open to Platinum and Centurion Cardmembers and, in this case, extended the experience to their families. The lounge served signature food and cocktails by Jim Meehan of New York City’s trendy Please Don’t Tell (PDT) restaurant. It also offered portable phone chargers that were pre-charged so cardmembers could recharge while skiing, plush neck gaiters, gourmet Vosges chocolate tastings, complimentary demos of luxury ski brands such as Nordica and Salomon, complimentary ski lessons with three-time Olympian Heidi Voelker and hand massages and custom lotions from Canyon Ranch spas. Guests were also encouraged to tweet about the experience on #centurionlounge and #americanexpress. “We heard that people skiing at a neighboring resort saw the tweets and changed their plans for the day to come to Deer Valley instead. The word-of-mouth was really strong,” Litte says. Agency: Momentum, NYC.